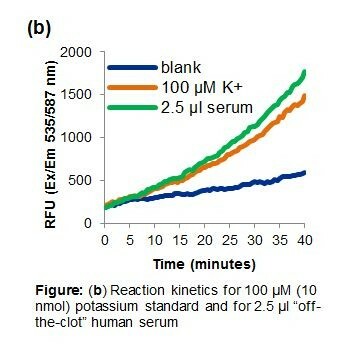 Potassium (Serum) Detection Assay Kit (Fluorometric) | K940 | BioVision, Inc.
Potassium (K+) is an essential micronutrient that regulates osmotic balance in the body along with sodium, calcium, magnesium, chloride and phosphate. It is required for various body functions such as muscle contraction, neural impulses and also as a co-factor for several enzymes. Blood potassium level is tightly regulated and ranges between 3.5 - 5.2 mM for healthy adults. Hypokalemia (low potassium levels) can lead to hypertension, whereas hyperkalemia (high serum potassium level) indicates heart problems or kidney failure. BioVision’s Potassium Assay Kit is a simple plate based assay kit for the measurement of potassium concentration in human serum samples. It is based on a potassium detection agent that is activated by potassium. The detection agent catalyzes a reaction between two substrates in presence of potassium, leading to the formation of an intermediate, which further reacts with the developer and oxidizes a non-fluorescent probe producing a strong, stable fluorescence signal. 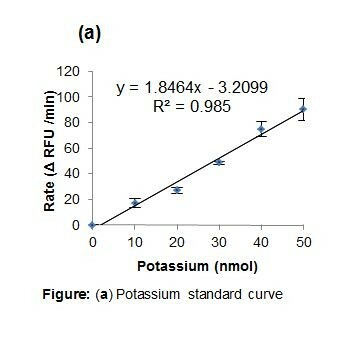 The rate of the reaction is proportional to the potassium concentration present in the sample and can be monitored at Ex/Em= 535/587 nm. 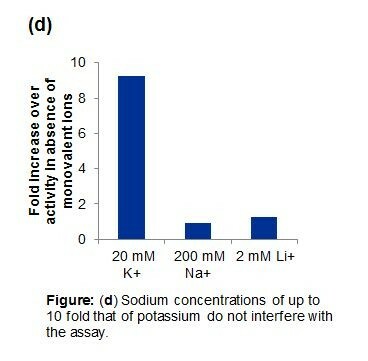 Sodium concentrations of up to 10 fold that of potassium, do not interfere with the assay. 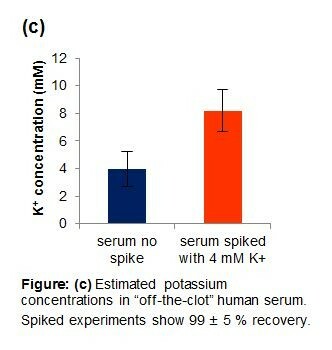 However since serum has about 25-30 times higher sodium levels that potassium, it can slightly activate the potassium detection agent (although to a much lower extent than potassium). A sodium masking agent has been included in our kit, which prevents any activation caused due to sodium present in serum delivering highly specific for the detection of potassium. The kit can detect as low as 10 nmol of potassium per well and is linear up to 50 nmol.